Owls Creek Marina is planned with 90 floating boat slips for vessels 50' - 70' long, a ship's store and restaurant, and a major municipal boat ramp complex with 8 launch/retrieve lanes and 237 trailer parking spaces. A minimal amount of dredging is required for access to the boat ramps, and approximately 1.3 acres of vegetated wetlands will be mitigated. 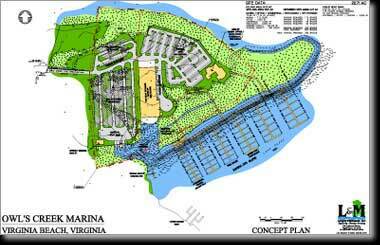 The boat ramp complex anticipates relocation of the municipal Owls Creek Boat Ramp, which will allow room for the Virginia Aquarium to expand.